Brief Synopsis – The story of a German U-boat crew and its Captain during the battles of the Atlantic during WWII. My Take on it – This is another movie that I have been purposely avoiding for so many years. It is currently rated #68 on IMDB’s top 250, but due to it’s length and teh fact that it’s all in German definitely put me off for a long time. In my quest to try and watch as many new movies this month as I can, I decided to finally give this one a try. I enjoyed the movie, but I felt that at 3 and a half hours, it was just waaay too long and there were just too many lulls in the narrative. The story is captivating and had it been tighter and more focused it would have been a masterpiece. As it is, it just slightly misses that mark IMHO. Director Wolfgang Petersen and his crew did an excellent job at making us feel the claustrophobia that sailors in a submarine must encounter during their service. They even chose to film all shot from within the submarine itself instead of removing wallas for the shooting of those scenes. I think that was a very wise choice. This movie was nominated for 4 Oscars including best Director which was the most nominations ever garnered for a non-English language film up to that time. Bottom Line – Very well done movie, but too long. The feeling of claustrophobia that most submarine crews must endure is well presented and even makes the viewer feel that they are themselves aboard the sub. Recommended! Interesting review, been meaning to watch this movie for a while now. I really do like this a lot more than you. It is a long movie though. i don’t think i’ve seen the director’s cut, but i certainly enjoyed whatever version i saw (i forget how long it was; it was longish but well-acted and well-directed. In English I think Jurgen Prochnow is a bit of a ham, but he was great in this. I definitely agree with you on that! 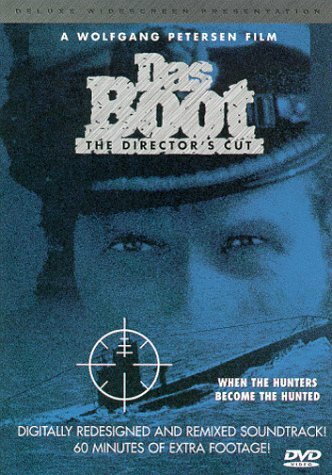 I first saw Das Boot transmitted as a series on the BBC and was left gasping at the end of every episode. For me those natural ‘cliffhanger’ moments were spoiled in the lumping together of the series into a mega-film. I would have to say that I agree with that sentiment Paul. I didn’t find too many moments where I felt that way during this. Ill check it out. Tnx fir stopping by and commenting. I usually like longer movies, but this one just felt too long imho. But as you said, to each his own.